Understanding is the master key that opens many doors in life. When you take time to understand with your eyes, ears, senses, sensibilities and heart, it shows yourself and others that all things in life are possible. Listen, Learn... Understand! 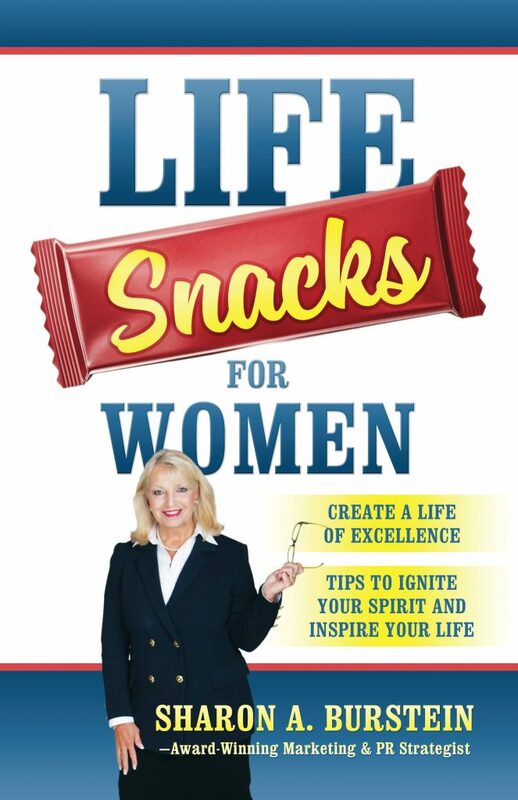 Life Snacks for Women is a fabulous book and a must read for women of all ages. It inspires and offers women to think in different ways, but most of all, this brilliant book celebrates women and encourages them in so many ways. The easy format of one word with inspiring messages makes this format easy to read and digest. Its messages resonate and encourage women, building them up and celebrating women of all ages. From young girls through more mature women, Life Snacks for Women inspires and helps celebrate women and that as women each of us is YOUnique, a word created by author Sharon Burstein, which is great. This is a book I will keep with me and is a great gift for all of the women I know for any reason and no reason. The words and messages I have found resonate with me throughout the day and linger in a fabulous way. I love that Life Snacks is now a book series. I really enjoyed reading Life Snacks for Women by Sharon Burstein. The book is very well written and descriptive. It would be really great for everyone to read, because this book is very encouraging and inspirational, and makes the reader the best, nicest person they can be. If more people were to read this book, the world would probably be a much better place. Besides the 69 chapters arranged from A to W, this book includes other helpful phrases and worksheets. Burstein has coined a new word: YOUnique! Love it! I think I’ll print out the 10 Point Action Plan for Life and tape it to my mirror to remind myself every morning. She encourages women to write down their dreams and goals to make them real. Whatever you conceive, you can achieve. Building your Leadership Image is a life long journey. Every skill and action builds upon it. 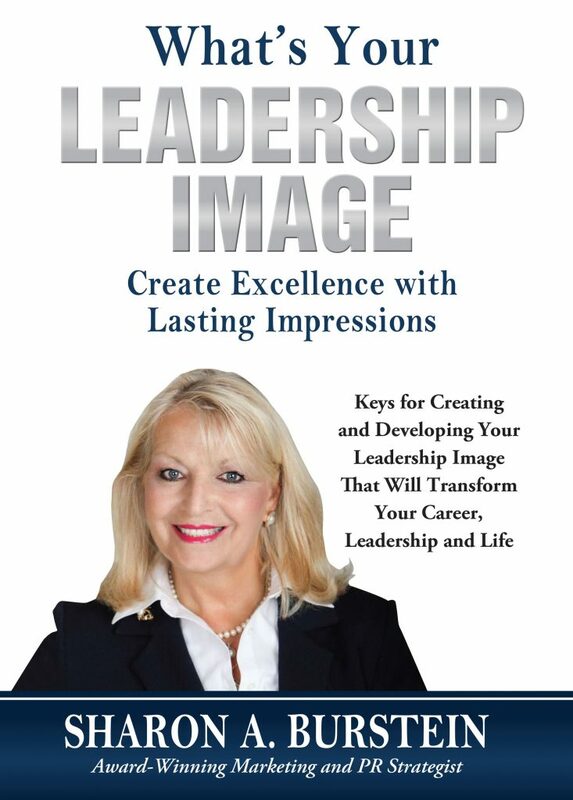 Knowing what your Leadership Image is can help you in countless ways in your personal and professional life. This book was written for people of all ages, to help identify and create a Leadership Image that is true to you. Just as you are uniquely you, so is your Leadership Image, and like your DNA is unique to you. Unlike your DNA however, you can choose, cultivate and develop your leadership skills. Leadership Image combines how you see your Leadership Image, how others view you and combines internal and external skills. Your Leadership Image conveys to everyone including yourself in your personal and professional life, the person you are. Knowing and understanding your Leadership Image helps you to better understand the person you are inside and out and aids you in building a solid foundation to grow you and your leadership skills. If it is your desire to have a positive impact and lasting results whatever your role, earning and understanding your Leadership Image will have long lasting positive results to help you be more effective in your life. Your Leadership Image is not about power, but empowering others. This book was written to help you make a positive difference, think differently and inspire you to achieve more in your life. If you want to become the best leader, you owe it to yourself and everyone in your life to read this book. Sharon provides readers and those in her speaking audience with keys that truly unlock your unlimited potential to be an effective leader and understand who you are and your Leadership and Leadership Image. If you’re ready to achieve more success and happiness, then follow the simple strategies in this brilliant book by my friend Sharon Burstein! Her wisdom is life-changing! This fast-paced, enjoyable book shows you how to impress, persuade, and influence people every time you "show up." Sharon Burstein’s book and speaking on Leadership and Leadership Image, reveals insights that are for anyone who wants to achieve greater success in their personal and professional life. If you want to take your Leadership to the next level, you will benefit from the easy and practical insights in this book and through Sharon’s speaking. When any person or organization is looking to enhance Leadership and IMAGE he/she/they will be inspired and lifted by the well earned insights on better knowing one’s own Leadership Image as shared by Sharon Burstein. Sharon has lived both roles as Leader and Image guide for many. When you read her impressive new book you will grow and lift your own Leadership Image. Your mind like your stomach needs to be fed to help you be your best! Life Snacks, soothing, satisfying and simple is food for the mind. Each 50 inspirational motivational bite and message is filled with delicious morsels that ignite the spirit, are motivating and uplifting. Intentionally short, to inspire quick Ah-ha moments and easy to digest, Life Snacks – is a tasty treat for adults and children of all ages. The words and messages in this groundbreaking book offer insight and inspiration for life, and are delicious snacks for the mind, body and soul. Each message captivates the reader and resonates. In this inspiring and practical book Sharon Burstein turns to principles she studied, taught, and lived for more than twenty-five years. Life Snacks gets people moving transforms and inspires them to achieve more in life and build success. One “bite” is never enough! 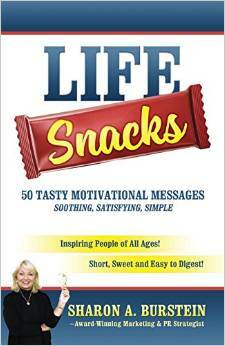 Life Snacks delivers the ultimate menu of messages to live s meaningful and full life. They inspire and transform. Each morsel can be used as a great topic and discussion point in the classroom, business or for personal enjoyment and growth. While Life Snacks can easily be read in one sitting, to get the most meaning out of each of the 50 life tidbits, it is be best to portion them out, to slowly digest. Timeless and ageless, Life Snacks is a book that will be savored, read repeatedly and long remembered. In these day’s of high technology and social media, many people do not and will not read long form content! How do you reach these people? Life Snacks, because it is soothing, satisfying and simple, but is rich in content and meaning. The collection of inspirational messages found in Life Snacks are powerful, meaningful and memorable. The reader is charged, renewed and refreshed with each turn of the page. It’s not how many words are in a message; it is what the message says, how it inspires, the lasting impression and or call that results in action. When you open "Life Snacks" you are on your way to a life feast of your own road map to live your best life. ... Sharon Burstein bursts with lovely words and thoughts - all pouring forth to make your life journey ever more lovely. Life Snacks is a real gem. I loved reading it at my own pace - I was able to focus on each "snack" at a time and really absorb the message and set my own goals. Sharon's writing style connects is sure to connect with all her readers and will help them ease into being the best versions of themselves. I love Sharon Burstein's refreshing approach in this truly motivational piece. "Life Snacks" has been the perfect go-to book for advice on how to pursue my goals and make the most of my opportunities. The message on page 3 of Sharon Burstein’s book titled “Life Snacks” has changed my life. Lesson #3 is Plan. Sharon has taught me to plan for tomorrow, today! Thus no matter what happens in the morning, my car is packed and read for my deliveries and sales calls. This one pointer has made me a more relaxed and efficient person and business owner. Thank you Sharon!